Despite the long list of problems listed Azaleas are actually relatively easy to care for and for the most part are disease and pest free. A healthy environment is the key to preventing diseases, insect and fungal problems. Good air flow, healthy soil, correct soil Ph are all good starting points for healthy plants. 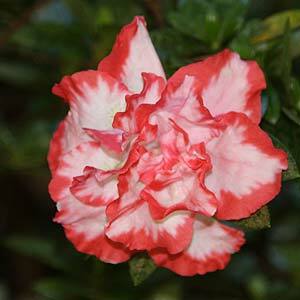 We list some of the common diseases and problems of Azaleas and provide some ideas about prevention. One of the most common problems with azaleas is the ‘black spots’ that appear on the foliage. Wonderful flowers but sick looking foliage is not the best look, so what causes Azalea foliage to look so untidy? In many cases it is Lace Bug, you can barely see them, but if you take the time to look at the underside of the foliage you can see little black spots. Lace bugs attack new foliage and they like to hide under the leaves, it gives them a little protection from the elements and the underside if the leaf is more tender for these little sap sucking insects. A number of methods of control are available including the usual organic ‘knock down’ sprays. However Lace Bugs lay eggs that hatch over a long period so any knock down spray would need to be applied fairly often. A systemic treatment has longer lasting effects, these work by the plant absorbing the the chemical and the insects then absorb it back when they start on the new foliage. A few brands exist, Confidor is one. Best time to spray is in late winter to early spring when the Lace Bugs are at their busiest. If you have a sever problem then a follow up in summer and autumn might be required. You can also make sure that the Azalea are well fed and happy at the same time, we like to water with a liquid seaweed fertilizer at least three times from spring to autumn. A little specialist azalea food in the form of a slow release pellet will also help. Mulch well to keep the root run cool. Azalea Lace Bug is a common problem. Remember that old foliage will not recover, you will have to wait for new growth for those azaleas to loose those black spots. If the foliage looks,’Rusty’, yellow to orange / red markings then you have Azalea Rust. For this one check the soil conditions, Dry, Wrong Ph, Low on nutrients then your Azalea is stressed and probably has a fungal disease. Look for a fungicide at your local nursery. This is probably ‘Leaf Gall’, simply remove and dispose of the infected material. Another fungal disease caused by poor air circulation and humidity, the petals will turn brown, often just as they are about to open. Other problems include: Thrips, White Fly, and Leaf Curling Caterpillars. Neem Oil is a good solution to these problems. Plant Azaleas in a semi shaded position in a well drained, humus rich soil, check with the nursery as some species and cultivars are more sun tolerant than others. Small trees for Gardens and Courtyards.